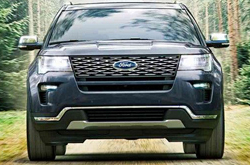 The 2019 Ford Explorer is understandably at the top of your list if you are preparing to take home a midsize crossover SUV soon. The Explorer hit the market originally in 1991 and has evolved dramatically over the years. Ford has continued to update this model with design enhancements, innovative features, and powertrain updates to the delight of automotive shoppers. The most recent major improvements were unveiled with the 2018 model. These improvements include additional exterior and interior color selections, new optional and standard features, as well as an overhaul exterior design. Minor improvements have been made to the 2019 Explorer. Ford has created five lovely trims for the 2019 Explorer for shoppers to compare and choose from. The lower-end trims are the base Explorer, the XLT, and the Limited. The higher-level trims are the Sport and the Platinum. While there are important differences between the trims, all 2019 trims have gorgeous design elements and impressive features. In the 2019 base trim, the Explorer is loaded with a USB power port, a manual single-zone climate control system, cruise control, automatic up-down powered windows, power-adjustable and heated sideview mirrors, speed-sensing power door locks, several color options for the cloth interior, manual folding rear seats for expanded cargo space and a standard sound system with six speakers. 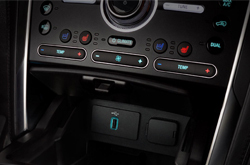 The 2019 Explorer Platinum, on the other hand, is outfitted with a heated steering wheel in leather, leather interior available in multiple colors, mounted controls for various features on the steering wheel, remote keyless entry, auto-illumination upon entry, a push-button ignition, ambient lighting, a rearview camera with parking assist, a power moonroof, powered adjustable driver's pedals with memory, powered folding rear seats, adaptive cruise control automatic LED headlights, power-adjustable and heated front seats, SiriusXM satellite radio with a premium sound system, LED tail-lights and LED fog lamps. When you test drive the 2019 Explorer at Westway Ford, you'll be impressed by its performance and power. The Explorer is equipped with trailer sway control, front and rear independent suspensions, terrain management control, hill start assist, an auto transmission, electric power steering, hill descent control and additional features. 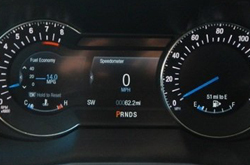 These features are paired with your choice of three powertrains. If you opt for a lower-level trim, your Explorer may be powered by a 3.5-liter, V6 Ti-VCT engine with 255 foot-pounds torque and 290 horsepower. Your Explorer may also be equipped with a 2.3-liter, V6 EcoBoost engine that delivers 280 horsepower combined with 310 foot-pounds of torque. The most powerful engine available in the 2019 Explorer is a 3.5-liter, V6 EcoBoost gas engine that will impress you with 365 horsepower paired with 350 foot-pounds for torque. When you select a new SUV, you understandably want that vehicle to be well-equipped with advanced safety technology. Ford has gone to great lengths to help you and your passengers remain safe on the road. 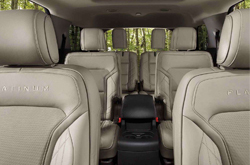 The Explorer for 2019 has exceptional standard and optional equipment from bumper to bumper. These features include a post-collision warning system, inflatable seat belts, blind spot monitoring, AdvancTrac stability control, a battery-saving device, traction management, an individual monitoring system for tire pressure, a security system, a perimeter alert and child safety seat tethers and latches for the back rows. You will also be protected by a front passenger sensor and airbag deactivation feature, front knee airbags, a rollover canopy airbag and front and side airbags. To learn more about the 2019 Ford Explorer, contact our dealership today. Westway Ford is the place to go to check out the latest model. Our sales experts will get you behind the wheel and on the road for a test drive.